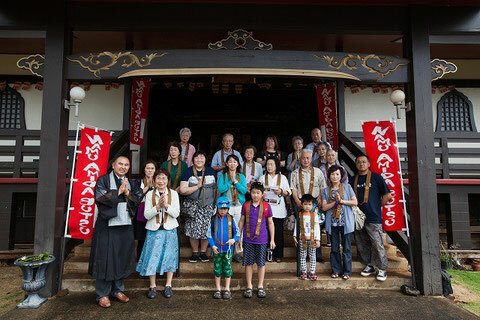 It was my great pleasure to welcome Raikoji Temple Group from Hachinohe, Japan on November 7, 2015 here at Koloa Jodo Mission. As always, I love meeting new people and I believe we had a very good fellowship and service together although it was such a short time visitation. I'd like to express my sincerest appreciation to Mrs. Kimura of the Raikoji Temple who led the group, for generous donation and gifts. Also Mahalo goes to my children who performed Ukulele and Hula for the group. They actually perform Hula at various places and occasions but especially this time, they received the warmest and loudest applause they ever had. To my surprise, they also had a tip from the lady who said who were learning Hula in Japan. I am hoping to welcome more visitors and groups here at Koloa Jodo Mission so that I could share Dharma-happiness with more people. For your information, I can provide a short temple tour including sermon or explanation of Buddhism, upon your reservation. And if I get some time, I can prepare refreshments of Sushi! If you are interested in the tour, please feel free to call me at 808-742-6735.